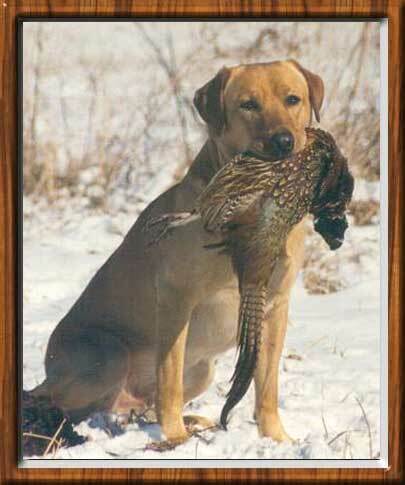 Whether in training, at a hunt test or field trial, waiting patiently in the duck blind, flushing pheasants from heavy cover or comfortably stretched out in front of a warm fire on a cold winter night, Beans was extraordinary dog with exceptional trainability and natural talent as well as having wonderful conformation and structure. He always had a highly motivated tail wagging "let's go get um" attitude and is just as happy retrieving bumpers in training as he is working a field or retrieving ducks in the icy cold winter river water. Before he turned 2 years old, Beans had completed his CD title with a first and second place, Junior Hunter, Senior Hunter and Master Hunter titles, Working Certificate Excellent and qualified for the Master National. While still only 4 years old, Beans had 25 Master Hunt test passes, qualified for his 4th consecutive Master National and has earned the Grand Master Hunter certificate from High Performance Labs online magazine. He is training for and has competed in two field trials and has shown great promise there as well. Oct. 9,1999* AKC Senior Hunter (SH) July 28, 2002 Earned 20th Master Hunter ribbon! Jun 24, 2000** AKC Master Hunter (MH) June 22, 2003 Earned 25th Master Hunter ribbon! Yea! Bringing the duck home! Junior Hunter title at 9 months! Senior Hunter title at 15 months! Master Hunter title at 23 months! !